If anything this image shows us just how tough it was for the South Africans fighting in Italy during WW2. 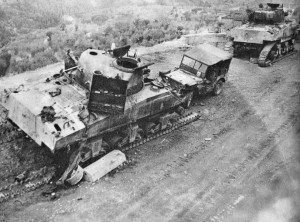 Unlike the usual images of victory and triumphal equipment and men, this image shows us just how hard the fighting was and the awful toll taken by the South Africans. Here are two of the 6th South African Armoured Division’s American made Sherman tanks disabled in the battle to take the Peruggia highlands, Italy. 1944. Winston Churchill’s idea that they could strike at Nazi Germany via Italy and what he called ‘the soft underbelly of Europe’ proved to be anything but soft and easy – as the Allied came up against well trained, cohesive and determined German defenders – in extremely difficult mountainous terrain – well suited to defence. The environment proved extremely hard going for an armoured attack – which is exactly what the 6th Armoured Division was tasked to do, and to add to the hardship – extreme weather played a role too with plummeting temperatures, snow, slush and mud. In fact to Churchill’s point the troops sarcastically called the Italy campaign ‘a tough old gut’. These South Africans proved time and again what a tough and resilient nation we are, and our full respect to them all.